Preheat oven to 450 degrees. Line large baking sheet with parchment paper or silicone baking mat and set aside. Wash brussels sprouts and peel away first layer of leaves. Trim bottom of brussel sprout if necessary. Toss brussels sprouts with olive oil and salt. Place onto baking sheet and bake 20-25 minutes turning once. While brussels are cooking, place balsamic vinegar and sugar into a small skillet. Place over medium heat and cook until sugar melts and mixture starts to thicken. Remove from heat. 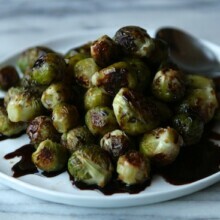 Drizzle syrup over hot brussels sprouts and toss to coat. Serve warm.